Libba Tracy likes to ride the wave of the moment when she is creating. Her inspiration comes from simply getting into the studio and playing in the clay. Lots of play has allowed her to master handling the clay with a freshness that breathes life into her ceramic sculptures. 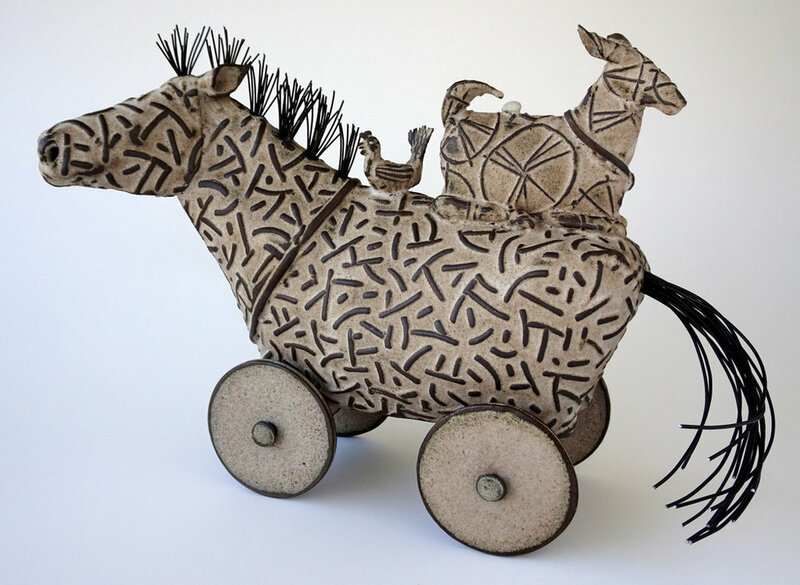 Libba’s whimsical clay creatures balance a folk art spontaneity with elements of classical sculptural art. This is topped off with a dash of humor, and results in delightful three dimensional presentations of metaphorical narratives. THE RED HOUSE STUDIOS & GALLERY is open Monday thru Saturday 10:00 - 5:00 and Sunday 10:00 - 3:00. DONATE & HELP SUPPORT THE RED HOUSE - THANK YOU! All images and content on this website are protected under the Copyright of the individual artists represented herein, and the Copyright of SVFAL 2019.